The German group Pulver are this week’s featured Meet The Band artist. They just released a self-titled EP. Vocalist Dave Frohlich introduces us to his band. Chad Bowar: Give us a brief history of Pulver. Dave Frohlich: Pulver was founded in late 2016 in our guitarist and drummer’s basement. In autumn 2017 we recorded our first EP, joined Gates Of Hell Records in January 2018 where our EP was just released. Describe the songwriting and recording process for your self-titled EP. Our songwriting consists of a whole lot of jamming, throwing ideas around and changing riffs and melodies until we achieve something that all of us are comfortable with. We recorded the songs with our friend Heiner Kunkel, who also mixed the whole thing at Dreiklang Audio in our hometown of Aschaffenburg. We then sent the tracks to Richard Behrens at Big Snuff Studio for mastering, where we will also be going to record our full length album in October. How would you characterize the album’s style/sound? 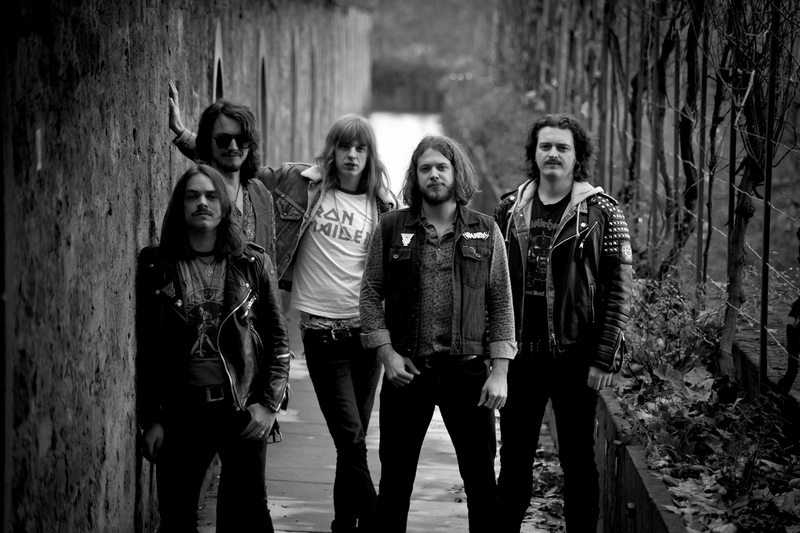 Very raw, unpolished NWOBH with a tad of late ’70s hard rock. How did you come to sign with Gates Of Hell Records? They were recommended to us by our mutual friend Karmazid, who also did our artwork. So we sent them our demo and fortunately they liked it! What are your goals and expectations for the release? Our only goal is that people bang their heads to it in joy. What has the early response been like? What has been your most memorable Pulver live show? For me personally, that has to be our show with Blood Ceremony and Admiral Sir Cloudsey Shovell in Wiesbaden. That was our second gig (if I remember correctly) and I’ve been a big Blood Ceremony fan for quite a while, so I was nervous as hell to open up for them. But everyone in those two bands was very down to earth and treated us extremely kindly. We played a good set and even got to play another show with The Shovell two days later in Frankfurt. Great week. We’re gonna play a few shows to promote the 7″ but will mostly concentrate on rehearsing and writing songs for the album. But we’re definitely planning to play a release tour for that and a lot more shows when it is out! Through my dad. He’s a bassist and played in a few pretty cool local rock bands when I was young, so I picked up playing bass when I was in my early teens and played a few bands. It pretty much went on from there. At first, mostly the stuff my parents listened to, so Danzig, Soundgarden, The Cult, etc. Later, when I was about 13, I discovered bands like Iron Maiden, Motörhead, Twisted Sister and all that good stuff. Those three were the first bands I ever bought an actual CD/vinyl from and I still love them today. Probably my dad’s old band? Can’t say for sure anymore! What’s the best concert you’ve attended? Probably Hawkwind at the last Hell’s Pleasure Festival. That was pretty intense! How’s the heavy music scene in your area of Germany? In our hometown, there’s really not much of a “scene” in that sense at all. Luckily, we have some great festivals nearby, like Hammer Of Doom and Metal Assault in Würzburg and of course Keep it True is only an one hour drive away. Who are you all-time top 5 German hard rock/metal bands? Apart from the thrash legends Sodom, Kreator and Poison, in no particular order: Helloween, Scorpions, Trance, Running Wild, Lucifer’s Friend. Crush your enemies, see them driven before you, and hear the lamentation of the women!